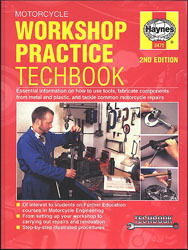 An essential book including workshop design and safety that includes how to use common and specialist tools, measuring equipment, testers and gauges, thread and fastener types, metals and plastics used in motorcycle manufacture and also information on fuels, lubricants, chemicals and sealants. Haynes' easy-to-use motorcycle shop manuals can save you money in repair and maintenance bills. Step-by-step procedures and detailed illustrations guide you through every job, from routine maintenance and troubleshooting, all the way to complete teardown & rebuild.